The decision was made for Roger’s safety, but the added advantage was that Mittenwald had a school that taught violin- and guitar-making. He remained at Staatliche Berufsfachschule throughout the War, where he gained a thorough grounding in instrument building with an emphasis on traditional hand tools. Eventually graduating with a Master’s Degree and the title ‘Gitarrenbaumeister’, Roger returned to Berlin to work with his father. Wenzel’s guitars were anything but traditional, and in addition to making acoustic and electric Hawaiian guitars, he is widely regarded as the first German electric guitar manufacturer. He named his company after his son. Wenzel’s construction methods and design approach were also innovative. Although he had built fairly traditional archtops before the war, his enforced inactivity provided the opportunity for a rethink. When he resumed building, Wenzel introduced laminated necks and highly distinctive carved tops. Both are significant because Roger would later adapt his father’s ideas to his own designs. No doubt post-war Germany was not an ideal environment for any guitar manufacturer and Wenzel ran into ‘difficulty’ when he was imprisoned for violating German currency exchange regulations in 1951. Roger was obliged to take responsibility for running the family business, but it didn’t go well. Wenzel was regarded as a capable businessman who tended to be frugal. Roger was the opposite and his fondness for the high life ended up ruining the company before his father was granted amnesty and released. Roger decided to escape his creditors by emigrating, so he wrote to Gibson President Ted McCarty asking for work. His Gitarrenbaumeister diploma proved sufficiently impressive for McCarty to offer Roger a job and pay for his passage to the USA in September 1953. During his first year with Gibson, Roger designed a jazz guitar but fell out with McCarty, who wasn’t sold on Roger’s ideas for improving Gibson archtops. There are also reports that there were tensions with the rest of Gibson’s workforce, many of whom had fought in WWII less than a decade before. Perhaps due to these factors, Roger told Gibson he was taking a ‘vacation’, but instead headed west to play guitar on a cruise ship bound for Hawaii. When he got back to LA he looked up Francis Hall, who had previously been in business with Leo Fender, and had purchased Rickenbacker in 1953. If timing is everything, then Roger’s really couldn’t have been better. Rickenbacker had been a family-owned company that enjoyed some success with archtops and electric lap steels, but Hall’s association with Fender had opened his eyes to the potential of the electric guitar. In 1954, Hall hired Roger to work for Rickenbacker and this time he didn’t waste his efforts trying to reinvent the wheel. Instead he spent the following eight years designing the classic Rickenbackers that define the company’s aesthetic to this day. 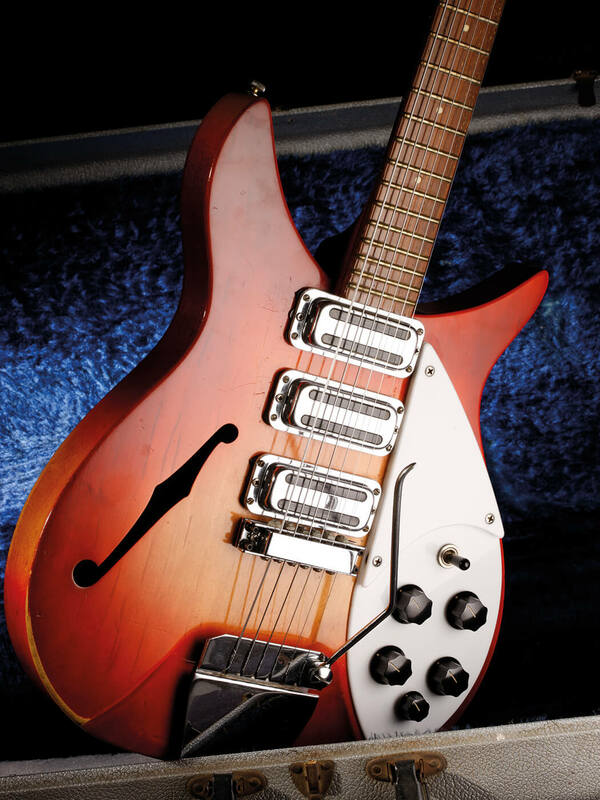 The Combo 800 models are regarded as a collaborative design effort between Roger, Paul Barth and Francis Hall, but Roger really hit his peak during the late 1950s, when he designed the Rickenbacker solidbody and Capri models that would morph into the 300 series, along with the 4000 and 4001 bass models. He would also build custom guitars and personally construct prototypes while working at Rickenbacker. Francis Hall described Roger as “the father of our modern Rickenbacker designs”. If you check out Wenzel Rossmeisl’s Roger guitars from the 1940s, many feature laminated necks, with the laminations continuing through the headstock. Extra laminations were used to achieve the necessary headstock width and you often see a sharply carved volute. In essence, they can be considered to be prototypes for the Rickenbacker necks on Roger’s designs. Rickenbacker’s cast metal tailpiece with a central ‘R’ motif is another common feature. However, the feature most closely associated with Roger has become known as the ‘German Carve’. It can be described as a rounded and even step all around the top edge of the body that elevates the centre section. It’s quite different from the gradual curves of a conventional archtop and it was actually developed by Wenzel Rossmeisl. The idea came about due to the shortage of appropriate guitar-making materials in Germany after the war – particularly spruce that was thick enough to be used for carved tops. Wenzel would use old floorboards, often laminated together, and some might say the very distinctive look suits solidbodies better than archtops. The German Carve has certainly influenced other builders, with one time Ricky apprentice Semie Moseley making it a feature of Mosrite guitars and Dennis Fano recently reviving the practice on certain Fano and Novo designs. Having enjoyed such stratospheric success at Rickenbacker, you might wonder why Roger decided to leave the company behind. But consider how little has changed at Rickenbacker since his departure in 1962. Rickenbacker is a guitar company like no other, and besides a new colour here or a modified neck join there, it has simply carried on producing the same Rossmeisl-designed guitars for decades. Maybe Roger realised there was nothing left for him to do, so a move to Fender made perfect sense. Again Roger’s timing was perfect when he showed up in Fullerton and offered his services to Leo Fender – who hired him on the spot. Fender’s sales team had been pestering Leo for a line of acoustic flat-tops and he saw Roger as the man for the job. The two collaborated to produce a range of acoustics with bolt-on necks and Fender style headstocks. Fender also applied for a patent for the metal tube that was fixed to the neck and tail blocks for structural rigidity, but it was actually the revival of a pre-war Larson Brothers design. The range included various six-strings as well as a 12-string with a hockey stick headstock. Fender managed to get them into the hands of numerous stars of the day, but Ray Davies of The Kinks is the only name player who continued playing a Fender acoustic for any considerable time. A new acoustic model appeared in 1966 called the Wildwood, with a range of colours that might have been more familiar on custom-order solidbodies. Roger had a contact in the timber industry who would inject dyes into growing beech trees. The colours would permeate throughout the trunk and when harvested, the brightly coloured timber was cut into veneer sheets. The same year saw the introduction of the Coronado models. Designed by Roger, these came in six- and 12-string guises, and there was even a bass version. Like the acoustics, the Coronados met with limited success. If the Coronado was intended to compete with Gibson’s ES-335, it was hamstrung from the get-go with a fully hollow body, a bolt-on neck and low output pickups. However they are fine-sounding guitars in their own right – especially the 12-string. While at Fender, Roger was also instrumental in designing the Telecaster Thinline – or more accurately the way they are made. Like Rickenbackers, Thinline bodies are cut to shape, routed from the back to create acoustic chambers and finished with a cap glued over the back. A final attempt at German Carve archtops was also made, with the LTD and Montego. With pickups and electronics hand made by Freddy Tavares, Roger’s friend and assistant Phil Kubuki explained, “the LTD guitars were made as prestige items, they weren’t intended as a profit source”. Although Roger’s relationship with CBS soured, the new management understood the importance of product placement and a plan was hatched to make a handful of one-offs for The Beatles and Jimi Hendrix. Roger’s idea was to build Telecasters and Strats using solid rosewood for the necks and bodies. Rosewood is extremely heavy, so Roger opted for two rosewood slabs with hollowed out chambers for weight relief, sandwiching a thinner central layer of maple. Harrison famously used his rosewood Tele throughout the Let It Be recording sessions, but Hendrix sadly died before his Strat was delivered to him. Friends and workmates have described Roger as a flamboyant man who liked to live life to the full, always dressed in the latest clothes and had a taste for sports cars. The latter would have a sad consequence, however – he was involved in a serious car crash that left him with severe head injuries. Things were never the same after this moment. By the early 70s Roger had left Fender, was divorced and heavily in debt. He was so broke that his mother had to pay for his ticket to fly back to Germany in 1971. Sadly it was no longer ‘home’ since Roger had taken US citizenship, and without German citizenship he struggled to find employment. Roger ended up working as a salesman at the Kaufhaus des Westens department store in West Berlin. Wenzel’s business ceased trading around the time of Roger’s return and the elder Rossmeisl died in 1975. Sadly, just four years later at the age of 52, Roger also passed away, leaving behind some of the most distinctive guitar designs of the golden era, none of which carried his name.